Moringa is a plant that, until just a few years ago, has not been known to many consumers in western countries. For thousands of years, however, the leaves, bark, flowers, seeds and other parts of it have been used in India to make medicines and as a food source. The popularity of this plant has exploded in Europe and North America since early 2010’s and it has been growing ever since. Here are some basic facts about this tree, and its current and potential uses. For thousands of years, moringa or Moringa oleifera has been touted for its health benefits presumably due to its many phytochemicals and antioxidants. Moringa is native to North India and it can go by many names from drumstick tree to horseradish tree or even ben oil tree. In Ayurvedic practice it’s referred to as Shobhanjana, or “very auspicious tree”. Commonly, almost all parts of the tree are consumed or used as herbal medicines, but most often the leaves and pods are consumed due to their many health benefits. Moringa leaves are very nutritious. Just one cup provides: 2 grams of protein, 19% of the recommended daily amount of vitamin B6 and 12% of the recommended daily value of vitamin C. Moringa contains many powerful antioxidants. One is quercetin which may help decrease blood pressure. It also contains chlorogenic acid which may help moderate blood sugar after meals. Research shows that moringa may help lower cholesterol levels which may reduce one’s risk for heart disease. Moringa can also be good for the planet. It is a drought resistant species requiring very little water. It is also adaptable to many different soils and climates making it highly resilient and sustainable. It has been successfully cultivated in Africa, southwest Asia, Madagascar, and the Philippines. In United States it is sustainably grown in California, Arkansas, Arizona, Hawaii and Florida. There are many ways to consume moringa. Moringa powder can be added to smoothies and made as a tea. Dried leaves are often used as additives to dishes or baked goods to increase nutritional value, or brewed as a tea. And of course, moringa supplements are also now available, although to get the most nutritional value many holistic practitioners recommend drinking it as juice or a smoothie. 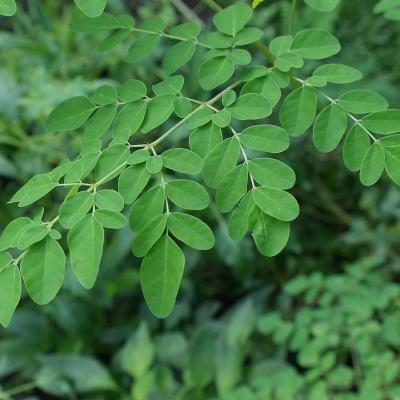 Where can I find Moringa? Moringa supplements and powder are widely available at local healthy food stores across the United States and Canada. But to get the most benefit, you should try to get it as either fresh cut or dried leaves from a sustainable farm. Willow Springs Farm in Arkansas near Little Rock is growing moringa trees and can quickly ship fresh leaves anywhere in the United States. You can also procure larger quantities of certified organic and conventional leaves and seeds from a permaculture Moyo Farm in Malawi. Or search for moringa on 1000ecofarms.com and choose from multiple moringa farmers around the world. What do you think? Have you ever experimented with Moringa? Tell us what recipes work for you and how you like to consume this miracle plant!